The Santa Maria was the flagship of Christopher Columbus, who is credited with the discovery of the New World. The ship was about 100 tons and approximately 100 ft. (30m) long. 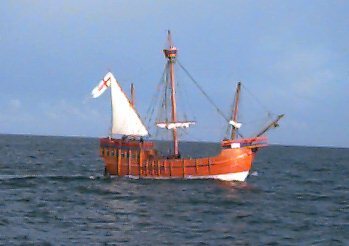 Unlike the other two ships on this voyage, the Niña and the Pinta which were caravels, the Santa Maria was a nao, or full rigged ship, which made it both larger and slower than her sister ships. The expedition, subsidized by King Ferdinand and Queen Isabella of Spain, set sail from Palos, Spain on Aug.3, 1492, carrying 88 men. Three days out of Palos, the Pinta was damaged, forcing a brief stop for repairs at the Canary Islands. On September 6, the three vessels again weighed anchor, with a due west course. Columbus maintained this course until October 7 when, at the suggestion of Martin Pinzon, it was altered to southwest. Before dawn on October 12 land was sighted, and early in the morning the expedition landed on an island in the Bahamas. Before an audience of curious natives, Columbus, in a solemn ceremony of Thanksgiving, claimed the land for Spain and called it San Salvador. Additional discoveries made during the next few weeks included the islands of Cuba, which Columbus named Juana, in honor of the Spanish princess, and Española, later corrupted to Hispaniola, believed by Columbus to be Cipango (Japan). When Henry VIII started the transition to the modern big gun broadside, with gunports cut in the hull, the first two ships so constructed were the Great Harry (Henri Grace a Dieu) and the somewhat smaller Mary Rose. The latter was named for Henry's sister Mary, a lively girl who was briefly queen of France; after her husband died, she married the man she wanted. It is no certain which ship first had holes cut in the hull to accommodate the heavy bronze guns placed in the hold. The Mary Rose was launched in 1509, five years before the Great Harry, but the guns and gunports may have come later. She was rebuilt in 1536, and her tonnage was increased from 500 to 700. The record of her sudden end, however, is well recorded. In 1545, when a French fleet attacked Portsmouth, the king was in the Great Harry, flagship of the defending English fleet, which included the Mary Rose. There had been strong skepticism in naval circles about the safety of cutting those gunports in the hull. That skepticism was confirmed when the Mary Rose heeled over in the breeze. The water rushed in through the open portholes, which were barely 16 inches above the waterline, and she sank quickly. Only 45 of a crew of some 600 survived. The victims, included the captain, Sir Henry Carew, whose wife was ashore and witnessed the disaster. The flooding of the ports a century later caused a similar wreck of the big new Swedish warship Vasa. The Mary Rose's big brass cannon were recovered, and the whole ship was raised and restored. The nature of her loss did not prevent further cutting of the gunports in the hull, but there would be frequent occasions when the big ships were unable to use the lower tier of guns in heavy weather. As with so many of those Tudor ship names, there would be seven other Mary Roses down to World War II. King Henry VIII has been credited by some as being the father of the English navy because he started the conversion of the clumsy tubs into effective fighting craft. His special drastic innovation came in 1514, when he introduced heavy cannon into the hold of the Great Harry, having holes cut in the sides of the ship so that the cannon could be fired against the enemy ship. This was possible before the Mary Rose was altered and may have marked the beginning of the broadside, which became the principal naval force for more than four centuries. Earlier warships had guns, but they were light guns scattered through the high towers at bow and stern. They were called "man-killers" because, in the close fighting of the rival ships alongside each other, they would fire down on the enemy crews, maiming and killing, them, but seldom doing any harm to the tough hulls. King Henry was keenly interested in the big bronze-case guns that came from the foundry of Hans Proppenruyter at Mechelen (Malines) in Flanders. He ordered some for his navy and tried them out by flattening the houses of the London suburb of Hounsditch. The great change in warships resulting from this innovation was "ship-killers" from the blows of the new guns in the hull. Earlier sea fights had been virtually at sea with rivals close alongside; now it became possible to stay off a long distance to pound the enemy. The Henri Grace à Dieu, popularly known as the Great Harry, was started at Woolwich in October 1512 and was launched in June 1514. She would seem to have been some 165-feet long and to have measure 1000 to 1500 tons. The shipwrights had objected to cutting holes in the sides for the great guns, but the king was insistent. There was a risk in this; the other great gun ship built at this time, the Mary Rose, suddenly heeled over and sank when the water came through her lower gunports. The Great Harry still had some of the awkward features of the old medieval round ship, with high forcastle and poop, but these were less extreme than in the earlier ships and their light "man-killing" guns were reduced in number. The Great Harry saw relatively little action-she was not involved with the French when they came over in 1545. She was luxuriously fitted out as a showpiece. One painting showed her setting out for the Field of the Cloth of Gold, but some claim that she was not in that expedition. She finally came to an end in 1533 when she caught fire at Woolwich, but she had served importantly as the example of the new heavy guns, firing through portholes cut in the hull. The Victoria is the first ship to have circumnavigated the earth. One of five ships in Ferdinands Magellan's expedition, it would be the only ship to survive the journey. The Victoria, which was built similar to Columbus' Santa Maria, weighed about 85 tons, and was built in the port of Guizpiziozm. The other ships in the voyage were: the Trinidad, the flagship for the voyage and weighed 100 tons, the San Antonio, 120 tons, the Concepcion, 90 tons, and the caravel, Santiago, which was 75 tons. The crews for each ship was somewhat over 200 men. On September 20, 1519, Magellan sailed from Sanlùcar de Barrameda and in November of that year reached South America. In February 1520, he explored Rìo de la Plata estuary, and on March 31, 1520, his fleet put into Port San Julian, where it remained for nearly six months. During that period, the Santiago was wrecked while searching for provisions and a mutiny occurred. After the mutiny was quelled, Magellan sailed into the passage to the Pacific Ocean that now bears his name, the Staits of Magellan. The Straits are 334 miles long, and was discovered on October 21, 1520. While navigating the treacherous Strait, the crew of the San Antonio deposed their captain and returned to Spain. After 38 days, on November 28, his three remaining ships sailed into the ocean, which Magellan named "Pacific" because of its calmness. He reached the Marianas, or Ladrone, Islands on March 6, 1521, and ten days later discovered the Philippines, landing on the Island of Cebu on April 7. There he made an alliance with the ruler of the island and agreed to aid him in an attack on the natives of the neighboring island of Mactan. Magellan was killed on April 27 during the Mactan expedition. Shortly after Magellan's death, the Concepcion, too damaged to go further, was burned, and the remaining two ships continued on to Moluccas, arriving on November 6, 1521. There it was decided that the Victoria would continue home via the route around the Cape of Good Hope while the Trinidad would retrace the Pacific route. En route to Mexico, the Trinidad was captured by the Portuguese and the crew were imprisoned. The Victoria, navigated by Juan Sebastian del Cano, arrived in Seville on September 6, 1522. Although Magellan did not live to complete the journey, he is still credited with circumnavigating the earth by passing the eastern-most point he had reached on an earlier voyage. The Victoria, after extensive repairs, made one round voyage to the West Indies, and then disappeared with all hands. For an exploring voyage of the highest significance, the records are amazingly meager about the crossing of John Cabbot to America in 1497 in the little Matthew. The voyage gave England a claim to North America, and it also led to the rapid growth of the cod fishery of the Grand Banks. Yet the story has to be pieced together and still has many gaps. Cabot had only one little 50-ton vessel for this venture. The Matthew had square rigs on the fore- and mainmasts, with lateen on the mizzen- a conjectural model at Bristol shows a solid rather than graceful build; the poop and forecastle were not as high as on many vessels of the day. her crew numbered only 18. The ship sailed from Bristol abut May 20, 1497, and made its landfall, presumable at the northern tip of New Foundland, on June 24. This was good time for a westbound North Atlantic crossing. The passage was apparently uneventful and the Matthew proved herself a good sailer. Cabot's landfall was close to the Strait of Belle Isle, which separates Newfoundland from the Labrador mainland, near Cape Degrat and, barely five miles from where Leif Ericson had made his temporary settlement in 1001. Somehow-the evidence is not clear-he made a run to the southward and encountered the Grand Banks, which were swarming with codfish, so plentiful that one had only to lower a bucket over the side to have it filled. Then, after possibly returning north to Cape Degrat, he headed for home, making a quick 15-day passage to the Benton coast and then doubling back to Bristol, where he arrived on August 6. Upon his return, Cabot immediately began making plans for a second voyage with five ships, but there is no record to as to whether the Matthew was one of them. Click here for a picture of the Matthew. In 1577, Francis Drake was secretly commissioned by Elizabeth I, queen of England, to undertake an expedition against the Spanish colonies of the Pacific Coast in the New World. With five ships and 166 men, Drake set sail from Plymouth on December 13, 1577. After crossing the Atlantic Ocean, two of the ships had to be abandoned in Rio de la Plata estuary of South America. In August 1578 the three remaining ships left the Atlantic Ocean and entered the Strait of Magellan at the southern tip of the South American continent. Sixteen days later they sailed into the Pacific Ocean. A series of violent storms, lasting more than 50 days, destroyed one ship and forcing another back to England. Drake, blown far south, sailed on his flagship, the Golden Hind. The lone vessel moved northward along the Pacific coast of South America, plundering Valparaiso and other Spanish ports; Drake also captured Spanish ships and subsequently made use of their more accurate charts. Seeking an east-west passage back to the Atlantic Ocean, Drake continued to sail north, possibly reaching as far as lat 48º; N, near the present U.S.-Canadian border. Unable to find a passage, he came about and headed south. The Golden Hind put in for repairs at an inlet (now called Drake's Bay) north of present-day San Francisco. Drake claimed the land for England, naming it New Albion. On July 23, 1579, Drake set ail again, this time heading westward across the Pacific Ocean. In November he reached the Moluccas, a group of islands in the southwest Pacific. He stopped at the Celebes and Java, islands of Indonesia, rounded the Cape of Good Hope at the southern tip of Africa, and reached England on September 26, 1580. Like the Victoria, the Golden Hind was gone for three years, and is credited with the first English circumnavigation of the Earth. Returning with a hold full of Spanish treasure, the original investors made as much as 1000% return on their initial investment. The Spanish ambassador urged Elizabeth to repudiate Drake and return the booty to Spain. Instead, in a ceremony aboard the Golden Hind at Deptford below London, she knighted him as Sir Francis Drake. For the four-hundreth anniversary of the landing in Drake's Bay, the British built a model of the Golden Hind and sent it to California. There is still some doubt as to the location of the bay, but general consensus points to the Point Reyes area as the location of Drake's Bay (New Albion Bay). The Revenge, built in 1577, was the first of a new style in ship building that would revolutionize naval warfare for the next three centuries. A relatively small vessel, measuring 500 tons or even less, she was only about half the size of the the Great Harry . Rated as a galleon, she carried 46 guns ranged along the two sides of her gun deck. In 1587, Sir Francis Drake was ordered to destroy the new armada which Spain, under Phillip II was building, for the purposes of invading England. Drakes mission was a huge success, inflicting heavy wounds on the new armada and forcing Phillip II to wait until the following year before attempting another invasion. In early 1588, Drake moved his flag from the Elizabeth Bonaventura to the Revenge, which many considered to be the best of the new ships. The great armada fight, from July 28 to August 12, 1588, fell into two distinct parts. During the first nine days, the rival fleets with a strong following wind, swept along the whole south coast of England, expending much of their ammunition, but inflicting relatively little damage. Both sides came through the first part relatively intact, but then came the "Protestant Winds" with quite different results. On July 27, after a week in the English Channel, the Spanish armada dropped anchor at Calais. The following evening, with strong winds blowing directly into Calais, the English sent eight good size fire ships, loaded with combustibles were sent towards the anchored armada. The Spanish reacted in the only way possible, which was to cut their lines and straggle out of the harbor. On Monday, July 29, came the Battle of Gravelines (named for a Flemish town near Calais), one of the fiercest and most decisive battles ever fought. With the start of the battle, the Revenge came into her own. With the Revenge leading the line, the ships proceeded to fire broadsides into the disoriented armada, chasing it up the the coast of England near Edinburgh, where further chase was deemed unnecessary. In 1589, the Revenge again put to sea as Drake's flagship, in an attempt to invade Spanish controlled Portugal. The invasion failed miserably, and it was decided to try capturing incoming Spanish treasure ships in the Azores, though this too, failed. With the ship in a battered condition, and no loot, Drake fell into disfavor with Elizabeth and was kept ashore until 1594. The Revenge came to her end in a glorious but bizarre episode that has become legend. To slow down Spanish naval recovery after the Armada, Sir John Hawkins proposed to cut down the supply of treasure from America by a constant naval patrol designed to intercept the convoys. The Revenge was on such a patrol in the summer of 1591. Several ships of the Revenge class lay in wait for the flotilla at Flores in the northern Azores, but nearly half the men on board were stricken with a fever epidemic. At the same time, Spain sent out a considerably stronger force of some 40 ships to capture the English from behind. On September 7, the Spanish fleet came upon the English while many were ashore, filling water casks, repairing the ships, and nursing the invalids. Most of the ships managed to slip out to sea, but the Revenge was trapped in the harbor. The overwhelming force was immediately upon the ship, which put up a magnificent resistance. The great San Phillip, a vessel three times her size, tried to board her, but was shaken off, while other ships were driven off and two of them sunk. The situation continued all through the night and into the next day, steadily becoming more hopeless. After assurances of proper treatment, and holding off dozens of warships, the Revenge surrendered -- the only English ship to be captured by the Spaniards in the whole long war. The captured Revenge never reached port, however, and was sunk along with scores of Spanish ships in a terrific gale in the Azores. She was cast upon a cliff next to the island of Terceira, where she broke up completely. This little 30 ton pinnace, built on the Sagadahoc (Kennebec) River in Maine in 1607, was the first vessel built by Europeans in America, north of the Spanish colonies. England sent over two colonizing expeditions in 1607. One went to Jamestown and became the first permanent colony. The other, known as the Popham Colony, settled in Maine on the lower Kennebec, several miles below the site of Bath, which would eventually become the nation's leading shipbuilding center. After a rugged winter and the death of a leader, the Popham colonists went back to England. It was the Popham group which built the Virginia. The colonists had come over in two small vessels. One of the well-connected captains was George Popham, nephew of the Lord Chief Justice; the other was Ralph Gilbert, a son of the late Humphrey Gilbert. They set to work at once in building a storehouse, fort, and other buildings, as well as the Virginia. Investigations indicate the following possible dimensions: length over all, 51 feet 6 inches; length of keel, 38 feet 6 inches; maximum breadth inside the planking, 13 feet; depth for tonnage, 5 feet. The Popham colonist were well aware of the vessel characteristics necessary for successful trading operations on the coast and rivers of New England. The Virginia apparently accompanied the discouraged colonists when they decided to return to England. Next to the Virginia in time, came the Onrust, or Restless, a small Dutch vessel built at New Amsterdam, the future Manhattan. In 1631 the colonist of Massachusetts built the Blessings of the Bay, about the size of the Virginia and forerunner of much further shipbuilding. It is difficult to distinguish this Virginia from the numerous others of the same name, but it seems likely that she was involved when Jamestown almost lost its status as the first permanent colony. In company with three other vessels she started out for home with the discouraged colonists, only to encounter Lord De La Warr's incoming squadron, to which the others joined to keep Jamestown going. In 1607-1608, Henry Hudson had made a name for himself, exploring in the icy regions to the north of Europe for the Muscovy Company around Spitzbergen and Novaya Zemlya. His success had not been complete, however, and questions arose of future employment. This was the period of Holland's most active overseas expansion, and the Dutch consul was able to get him in touch with the Dutch East India Company. The result was that he entered into a contract on January 8, 1609, to engage in exploration to the northeastward. Hudson was not happy with the rather ordinary little vessel provided by the Dutch East India Company. the Half Moon was only 60 tons-- a yacht, though not in the pleasure sense-- of old-fashioned lines, with high forecastle and poop and rather slender masts. He could get nothing better, however, and shipped a crew of 20, part English and part Dutch. Although his contract called for him to explore the northeast, Hudson convinced his crew to turn to the northwest where he, himself, really wanted to explore. The crossing, which started from Texel on April 6, 1609, was a stormy one. After a stop at the Faroes they came to the Grand Banks, where they found plenty of cod and a few French fishermen. They reached the American coast around the region of the Penobscot River, cut a new topmast, and began frequent contact with the Indians. They reached Cape Cod and ran south as far as North Carolina, deliberately not stopping at Jamestown. They looked into Chesapeake and Delaware Bays and, after skirting the New Jersey coast, reached New York Bay on September 2. Hudson was primarily interested in a strait through to the Pacific and this looked like a promising approach. He went on through the Narrows and then started up what would eventually be called Hudson River. It was broad and navigatible. Finally on September 19, they reached almost to the future site of Albany. Since it seemed to be getting a bit shallow for the Half Moon, Hudson sent out a pinnace to explore. But the the rapid contraction of the river soon dispelled the high hopes of a route to China, and Hudson reluctantly turned back down the river. he reached New York Bay on October 4 and then put out to sea. The Dutch East India Company had gotten a valuable potential for its 800 gulden. Thanks to this visit, New Amsterdam and New Netherlands would be an important part of Holland's overseas empire until 1664. The Half Moon put into Dartmouth in Devonshire, England on November 7. Adverse weather seriously slowed down Hudson's report to the Dutch East India Company, but the English, disturbed that an Englishman should have made what seemed like an important discovery for the Dutch, stepped actively into the picture. Hudson was picked up by the authorities with an Order of Council, but landed on his feet. His achievements stimulated Sir Thomas Smythe, wealthy head of the East India and Virginia Companies, who arranged to send Hudson back to America in a better vessel, the Discovery. He sailed almost at once and never returned; he found Hudson's Bay, and was set adrift by a mutinous crew. In 1610 the Dutch sent over to Dartmouth for the Half Moon and a naval commander took her out to the East Indies, where she lasted until 1617. Almost a century after Ferdinand Magellan discovered the strait which bears his name, two Dutchmen discovered an alternate way of connecting the Atlantic and Pacific by way of Good Horn around the southern tip of South America. The Dutch East India Company, formed in 1602, determined to prevent nonmembers from reaching their new trading centers in Southeast Asia. They forbade all outsiders from trying to reach Indonesia either by way of the Cape of Good Hope or by the Strait of Magellan. Two prominent Dutch nonmembers, Willem Cornelius Schouten, mariner of Hoorn (whence Cape Horn) and Jakob Le Maire, merchant of Amsterdam, determined to find a third way of getting to Southeast Asia. They set out from Texel on June 14, 1615, in two Hoorn ships. The flagship and sole survivor was the good-sized 360-ton Unitie and a amaller consort. These ships were substantially built with multiple planking. They went out by way of Cape Verde, Sierra Leone, and the Patagonia coast. Passing beyond the Strait of Magellan, they skirted Tierra del Fuego and discovered a strait, which they named for Le Maire, separating "Staten Island" from the mainland. On January 29, 1616, on another island, they discovered "a high, hilly land, covered with snow, ending with a sharp point which we called Cape Horne" nothing was said of the terrific westerly gales which would make "Cape Stiff" notorious. They proceeded on across the Pacific with the loss of the consort and the death of Le Maire. When the Unitie finally arrived at Bantam, she and her cargo were confiscated because of the irregular route. The officers and crew were sent back to Amsterdam to stand trial; Schouten sued the Govenor Coen for damages and recovered the whole value of the Unitie. Gradually, despite the extra mileage around Tierra del Fueago and the wild westerlies off the Cape, the Cape Horn route gained ascendancy over the Magellan run during the days of sail. The California clippers, racing to San Francisco, found that they could make better time around the Cape Horn than in the tricky and sometimes forbidding Magellan passage. The Dutch themselves generally used the Good Hope route. The little Mayflower, which brought 100 Pilgrims to Massachusetts in 1620, is one of the best-known and most warmly regarded ships in American history. There were other ships that brought settler; the Susan Constant was the flagship of the squadron that brought colonists to Jamestown in 1607, and the flagship Arabella headed the "Winthrop Fleet" that brought some 3000 colonists in 1630. But the Mayflower came alone and after a stormy passage landed her God-fearing passengers on a bleak coast at the beginning of winter. Those who survived the first winter told their story well, and there is still a flourishing Society of Mayflower Descendants. The Mayflower was a "tramp", chartered for the voyage. She had had a varied experience. In 1609 she was apparently trading with Norway and, like so many English freighters, engaged in the busy wine trade between Bordeaux and London. She may have visited Hamburg and the Baltic, and perhaps the Greenland fishery. 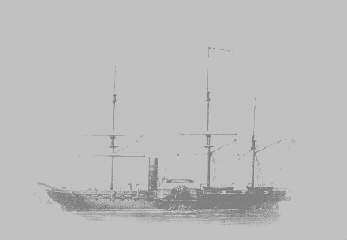 She was a somewhat tubby ship of 180 tons, with three masts. Her most distinctive feature was a very high narrow poop. If the ship were conventional, the passengers were not. Most of them were left-winged English Puritans, known as Separatists to signify their break from the Church of England. In 1609, they had moved from their homes in East Anglia to Leyden in Holland. By 1620, however, they decided to migrate to America. Sir Edwin Sandys, a prominent sympathetic Puritan, arranged with the Virginia Company to permit them to settle in the territories. They received the necessary financial support from a group of English merchants, with the understanding that they would repay the debt with fish and other overseas products. The Leydon group purchased a small ship, rather inappropriately named the Speedwell and sailed in her from Delft to Southhampton Water, where they rendezvoused with the Mayflower, which had been brought from the Thames. They sailed from Southhampton on August 5, but that was only the first of three farewells. The Speedwell soon signaled that she was in trouble, so the two ships put into Dartmouth for repairs on August 23 through September 2, but once out on the open sea, the Speedwell was in such a dangerously leaky condition that they put into Plymouth, where the smaller vessel was declared unfit for an ocean voyage. She returned to London with 20 passengers, who had decided that they had had enough. The other Pilgrims crowded aboard the Mayflower, 100 of them in addition to the crew. Besides 15 male servants, there were 41 men and 44 women. The final departure was on September 6, 1620. The landfall finally came on November 9 near Nauset on the back side of Cape Cod, in "one of the most dangerous strips of coast anywhere in the world." The landfall was called Provincetown, and before anyone went ashore, the Pilgrims produced an important constitutional document, the Mayflower Compact. The Compact, drawn up in the cabin of the Mayflower, not only served the immediate need for a form of government since the Pilgrims had no charter, but would serve as the constitution of the "Old Colony" until 1691. The Mayflower stayed on at Provincetown, at the tip of Cape Cod, for several weeks. The Pilgrims took advantage of this time to do repairs and explore the surrounding area. On December 11, they decided that the location of their new colony would be Plymouth harbor, a few miles to the northeast. Five days later, the Mayflower moved over there and the little settlement quickly began to take form. During the winter, half the colonist died, but when the Mayflower started back to England on March 26, no once chose to return with her. The later career of the Mayflower is not clear; there were rumors that her timbers were built into a barn. The Swedish warship, Vasa has had two periods of prominence, separated by more than three centuries during which she lay at the bottom of Stockholm's harbor. In 1628, she capsized during her first hours of active service. In 1961, she was raised from the depths. Still in sound condition, she has become a remarkable example of original conditions in great detail. A powerful ship of the line, she was constructed at the order of King Gustavus Adolphus, greatest of the Vasa line of Swedish rulers. She was expected to strengthen Sweden's command of the Baltic. The Vasa was 162 feet in length and 39 feet in beam, and had a displacement of 1300 tons. On her three decks, she mounted 64 bronze cannons, 48 of which were big 24 pounders. She was built by a Dutchman and commanded by a Dane. She had much in common with England's three decked great ship Sovereign of the Seas built in 1637. The big difference was the the Soveriegn had an active career of more than half a century, while the Vasa had only a few hours. On August 10, 1628, the Vasa set sail for the first time to move to another part of Stockholm harbor. A sudden gust of wind caused her to list sharply to port, so that the water poured in through the lowest tier of open gun ports. She sank quickly in 100 feet of water. Incidentally, England's Mary Rose had sunk in the same manner in 1545. A few of the bronze guns were rescued but thereafter she lay forgotten. As for responsibility, the Dutch shipbuilder and Danish captain were cleared. An embarrassing factor in the investigation was that the king, a soldier rather than a sailor, had dictated just what the basic dimensions should be. Apparently, the heavy weights were not properly distributed though the ship. In 1956, Ander Franzen, a local resident long interested in marine archeology, located the sunken hull after extensive research. He interested the Swedish Navy in raising the wreck; deep sea divers dug a series of tunnels under the hull; wires were passed, followed by heavy cables which could transmit adequate lifting power from the surface. By 1960, the hull began to reach the surface. Most wooden vessels, submerged for even much briefer lengths of time, tend to disintegrate. This is due in no small degree to the ravages of the Teredo navalis, or sea worm. The water of the Baltic, however, is distasteful to the sea worm, and the whole wreck remained intact. A museum has been developed in Stockholm harbor enabling the public to visualize just what a seventeenth-century ship was like. Even before she ever gained a fighting reputation, the English took great pride in the Sovereign of the Seas, designed and built by their outstanding naval architect Peter Pett in 1637. She came after a period of serious post-Armada neglect and was financed by the dubious ship money. Also, in retrospect, she stood out as a major step in the development of the sailing warship as the first three-decked "first-rate", a predecessor of Nelson's Victory. When James I had come down from Scotland in 1603, he let the navy, which had accomplished wonder under Elizabeth, go to pot. Things grew so bad under the early Stuarts that Barbary pirates raided the shores of the British Isles, carrying off men and women to slavery. This naval slump played into the hands of the Dutch, who were rapidly strengthening themselves, going so far as to wipe out an English settlement in the East Indies. One reason for the continued slump was financial. Navies cost money and in the continuing friction between the Crown and the Puritans in Parliament there was a stalemate in which the Stuarts tried to keep things going without submitting to Parliament. From 1629 to 1640 no sessions of Parliament were held, and the Crown had to resort to all sorts of strange devices to raise money. Charles I realized the need for a good navy and he and his henchmen finally hit upon a new device. It had long been a custom to all on the "Cinque Ports" of the southeast coast to furnish ships in place of making the usual land-based demands. To build up the navy, it was decided to call upon the whole country for "ship money". A howl immediately arose from the Puritan-Parliament group that this was an illegal subterfuge to raise funds without recourse to Parliament. If one looks at the ship money from the naval rather than the constitutional angle, it didi strengthen the navy. In particular, it produced the masterpiece of the mid-seventeenth century. The king wanted a combination of strength and beauty, and he got it. The 1141-ton, 100 gun Sovereign of the Seas was launched at Woolwich dockyard on October 13, 1637. Her distinctive feature was having three separate gun decks. The Revenge had introduced the idea of a single deck devoted entirely to broadside guns. But from this time on, there would be a few first-rate three-deckers to serve as flagships. Although they were always a bit clumsy compared with the two-decked "seventy-fours", it was felt that the extra height gave them a certain advantage. The Sovereign was herself cut down to two decks to remedy her cranky sailing habits. She was smaller than the Naseby (Port Charles) , but she played her part through the three Dutch-English Wars and was even a participant in the out set of the war against Louis XIV, taking part in the defeat of Beachy Head and later in the victory of La Hogue-Barleur when she was more than 50 years old. In 1696 she was burned by accident. Incidentally, one of Donald McKay's crack American clippers was also named Sovereign of the Seas. During her 12 year career, this ship, pride of the English Navy, provided the nation with two emotional extremes. In 1660 she brought Charles II back from Holland for the restoration of royal authority after two decades of interregnum or time out. The tens of thousand who cheered his arrival at Dover and then at London were overjoyed that the grim Puritan repression was over. Seven years later, at the end of the Second Dutch-English War, national humiliation was at its lowest when a Dutch fleet hijacked her and carried her back in triumph to Holland, where her symbols are still on display in the national museum. The Naseby, named for Oliver Cromwell's crushing victory over the royal forces in 1645, was launched at Woolwich dockyard in 1655. At 1230 tons, she was larger than the celebrated Sovereign of the Seas first of the three decked ships of the line. She appeared during an interval in the Dutch-English Wars, but she went south to the Spanish coast under Admiral Blake, one of England's greatest naval officers even though he had no previous naval experience. The Naseby's first prominence came in 1660, two years after the death of Cromwell. General George Monk brought his army down from Scotland and paved the way for the royal restoration. After Charles II was agreed upon for the crown, Captain Sir Edward Montagu, another army man who joined the navy, was ordered over to Holland with some 37 great ships to bring him back. The Naseby was the flagship of this fleet. The next five years saw a round of routine duties for the renamed Royal Charles, but then, with the start of the Second Dutch-English War, came a series of battles. Both in quality and quantity, the Dutch were probably the toughest and most evenly matched of any of England's naval enemies. The battles were hard-fought, knockdown, drag-out affairs, and the rival commanders of fairly equal high quality. One of her toughest fights came in the battle of Lowestoft in 1665 under the Duke of York as Lord High Admiral and Captain William Penn, father of the founder of Pennsylvania. In a tough duel with the flagship of Admiral Opdam, a chain shot killed two men standing alongside the future James II, but the Dutch flagship was sunk, with her admiral. In 1666, the Royal Charles was in two more strenuous actions, the Four Days' Battles and then the defeat of Admiral de Ruyter in the St. James Day action off North Foreland. In 1667 the English maritime situation was in grave difficulties because the navy's money was fast running out. The seamen and the dockyard workers had not been paid for a year or so and were in a somewhat mutinous mood. Under these circumstances, it was decided to pay off most of the navy. The Royal Charles and many other warships were deactivated, lacking repairs and with only a remnant of their crews, in the Medway, a curving tidal river which flowed into the south side of the Thames estuary. The laid up fleet tempted the Dutch to attack. Jan de Witt, the Grand Pensionary, wanted a chance to curb English arrogance. In addition, the Anglo-Dutch peace negotiations were under way at Breda and the attack might be reflected in the peace terms. Accordingly, in mid-June, a Dutch fleet of some 50 major warships and numerous smaller ones, appeared in the Thames. They first blasted the fort at Sheerness and removed or destroyed the stores of the new dockyard. The Dutch burned three of the large ships; a heavy pall of smoke hung over the whole area. The Earl of Albemarle finally gave vigorous defense leadership; guns were brought down from London; and the Dutch, afraid of being caught too far up the river withdrew destroying the Chatham dockyard. The captive Royal Charles was escorted to Hellevoetsluis, where big crowds visited the huge prize. Apparently the Dutch did not consider taking her into their navy; she drew too much water for general use on the Dutch coast. She lay there for a year and then ws sold at auction for breaking up. Her metal stern piece, showing the English coat of arms with lion and unicorn, was taken off and stored in a warehouse, along with a white ensign; two centuries later, these naval trophies were proudly displayed in the Ryjks Museum at Amsterdam. The Medway affair came too later to affect seriously the Treaty of Breda, which ended the Second Dutch-English War a few weeks later. It may have modified some of the more extreme English demands, but they did gain New Amsterdam (New York) and much else. The Royal Navy built a new Royal Charles in 1673.